>> I use the new Army Zero target since it was designed for this exact thing vs the old school one that was designed by an idiot. 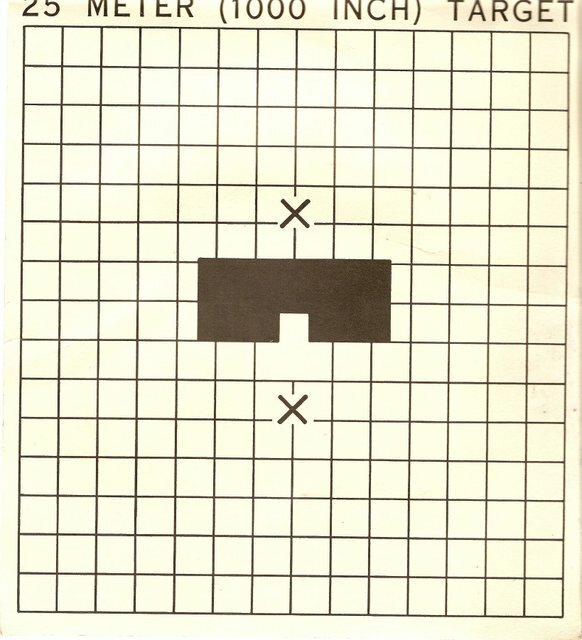 FC 23-11 (Unit Rifle Marksmanship Training Guide) was published in the early 1980s for the M16A1 era and it claims the reason for the silhouette-shaped aim point was to replace the “confusing” Canadian Bull zero target and have troops zero on the same shape/relative size target they’d see during qualification. They also eliminated explanation of “confusing” minutes and mils and went with 1 square=1 click as well as “confusing” descriptions of basic ballistics. Just use the “L” sight on your M16A1 when zeroing at 25 meters and flip it back when done. The zero target even has pictures with arrows to show which way to click the sights to adjust them. Brilliant! Until the M16A2 was adopted, followed by the M4 and then optics, lasers, and other sighting accessories that became common issue… Try to explain the how and why of the Small Arms Integration Book to someone that doesn’t understand Inches-Minutes/Mils-Clicks and basic ballistics. It’s worth noting the FC 23-11 is a well-written manual published by knowledgable shooters that did a great job explaining the decision process for the zero and qualification procedures the U.S. Army has been using since the early 1980s. The real failure was that this basic, initial program of instruction and qualification was intended to be only a basic, initial program. Soldiers were supposed to eventually shoot field courses (the Alt-C target was originally intended for other exercises to prepare for this), at full distance, on KD ranges, and learn higher level shooting. All of that is explained in FC 23-11. The simplistic nature of the initial course was to be added upon during a Soldier’s career. As with any potentially-useful program, when left to be handled by under-skilled personnel with no background or interest in the subject at hand (drill sergeants and other NCOs) along with leadershit with no background or interest in it, the program stopped at the simple, introductory level and began to retrograde. KD courses and full-distance course were eliminated due to logistics, followed by even the scaled exercises at 25 meter. The entire affair eventually dumbed down to the lowest-common-denomitor, minimalist affair common to every Soldier that has served since Reagan’s first term. 25 meter zero followed by “pop up” targets (or just the 25 meter Alternate “C”) course is the least effort approach that technically satifies minimal requirements. Sadly, because most Soldiers are illiterate this is the totality of their understanding. Not sure what you’re referring too in re full distance and KD courses being eliminated. The Marine Corps continues to utilize 200-500 yard KD course as part of their rifle qualification program. I agree Instructors must know what’s going on with respect to ballistics. It gives them the higher appreciation necessary to get the less informed (but still necessary) soldiers through basic qualification. To go in as an instructor thinking everything that happens on the range from primer ignition to target impact is magic does little to advance the basic skills of the troops who will be tasked with locating, closing with, and destroying the enemy by fire and maneuver. True, the Marines still use the KD range during routine qualification, specifically for Table One. This post was addressing U.S. Army deficiencies.